The War Machines is a really enjoyable story. It's unusual for the Hartnell era in that the Doctor has stepped into the contemporary world. 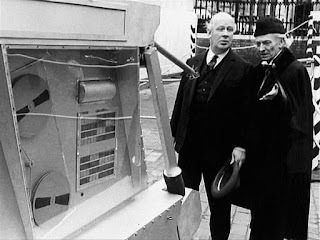 This story, written by Ian Stuart Black, was broadcast between the 25 June and 16 July 1966. And it feels like it takes place around then too. London isn't quite swinging in The War Machines but a setting like the Inferno club is at least a beginning. As is the introduction of Ben Jackson (Michael Craze) and Polly (Anneke Wills) as two new companions but more about them la...actually that's terrible writing, isn't it. It's as if I gave no thought to this article at all before I started writing it. Ben Jackson is a grumpy London sailor whose been left in the lurch whilst his ship has sailed off - with all his mates - to the Caribbean. He's a representative of all those actors that have started to appear on big screens, Michael Caine being the obvious example. He's Alfie in uniform with all his talk of 'birds'. Whilst Polly is the mini-skirted model-actress. If Ben Jackson is Michael Caine then Polly is Julie Christie. They're Doctor Who's nod to a changing world, which means poor Dodo is about to leave. I've said in recent articles that it is insulting how badly Hartnell has been treated but that's nothing as to the awful way Dodo gets written out. She doesn't even get a farewell scene. Her goodbye is delivered to the Doctor by her replacements. That's after she's been hypnotized and then bundled off to the countryside. It's no wonder Jackie Lane doesn't really want to talk about her time on Doctor Who but then she's not the first cast member to be bundled out suddenly in 1965/1966. So the Doctor and Dodo arrive in London. The Post Office Tower - as was - is finished and it gives the Doctor the heebie-jeebies. It leads to the Doctor blagging his way into the company of key scientists working on a massive computer project: WOTAN. WOTAN is going to be the central mind in a worldwide computer network due to be switched on in a few days. The Doctor's blagging skills we don't see but in his novelisation of the story, Ian Stuart Black has a little preview chapter where the Doctor seems to knock up some fake letters. Everyone knows this isn't going to turn out well. WOTAN turns out to be HAL from 2001 with even more grandiose plans and the ability to take over the minds of various humans to carry out its plans. Basically, because it is a whacking great electronic box that can't move. It can, however, create War Machines to carry out its plans. Dodo gets hypnotised when hanging out at 'The Inferno', which is one of London's hottest nightspots. It's there we meet Ben Jackson for the first time. We meet Polly earlier. She's Professor Brett's (John Harvey) secretary. She too will get hypnotized. Thus preparing herself for life as a Doctor Who companion. The bad guys fail to get the Doctor who works out Dodo's been 'turned'. He undoes the brain-washing and sends her off to the countryside to recover, Never to be seen again. Thereafter the Doctor relies mainly on Ben for support, whilst Polly gets 'turned'. However, she's not quite 'turned' enough to want to see Ben killed. Oh. Spoilers. We eventually see the War Machines in actions. They're big chunky boxes armed with fire extinguishers and massive hammers. The army can't deal with them but the Doctor manages to do so. The first War Machine's capture is slightly confusing (and in the novel, Ian Stuart Black gives a clearer explanation of what happens. Or an entirely different explanation if you like.) The Doctor then captures a second War Machine in a tense sequence. At this point, the series is also using journalists and newsreaders to give the story scale in a way RTD would do later. Indeed this is one of the Hartnell stories that could easily be turned into a New Doctor Who story with barely a tweak. You may, whisper it, think that it has already been done. It's called The Bells of St John. I've been waffling on for ages now but that's because this is a good little story and one that I'd recommend to new Doctor Who fans wanting to dip into the Hartnell era as with its London setting, use of the army and Hartnell's Doctor-in-chargeness it feels surprisingly modern and is generally quite fast paced for the period. It sees Dodo depart and Ben and Polly join up. *Later we will talk about the UNIT dating controversy. Or not.